Copyright Information - Sports event photos by Lenny Gemar on this site may be used for news and sports print and broadcast purposes, as long as attribution is given to "Lenny Gemar." 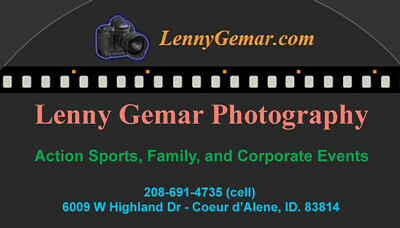 If the sports photo was taken by others, attribution should be provided as "their name/lennygemar.com". 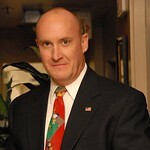 All other photos and photos used for other commercial purposes requires a license. Please contact me for information. Tribute web site with memorial Information available at tributes.com/KyrstinGemar. Welcome to Lenny Gemar Photography. This site is now my photographic home starting with 2009. Galleries from previous years may be found at my legacy photographic site. Some galleries require a password to enter. If you were provided an "Event Code" for your event, that will be the password to access your gallery. For more information and inquiries, send me an e-mail. Here's a copy of my business card. To learn more about me, please see my biography. My Couer d'Alene-area web cam.